>Given Firebug's mind share among web developers, how do you see the built-in developer tools interacting with it going forward? >Please provide a way to move this to the bottom rather than the top. It doesn't belong at the top of the browser. >IMHO this is duplication of effort.please consider joining the firebug team, and streamlining the UI so that it is suitable for inclusion in firefox by default.or maybe develop "Firebug Lite" based on the common codebase (the firebug team is already working on a suitable code split to enable something similar, right AT THIS MOMENT). >@Scott Tsai As we develop the console and inspector we are trying to improve and create APIs that Firebug can take advantage of as well. Think of Firebug as the heavy duty power tool, and the built-tools as the future of "View Source". 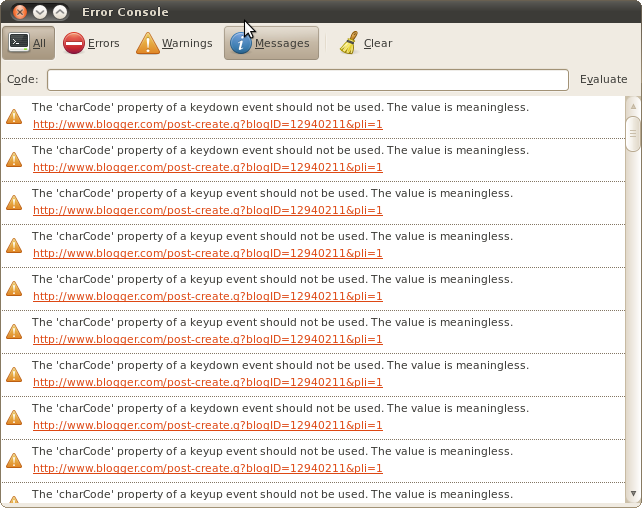 As far as interaction with Firebug, we do plan on writing some APIs that allow Addon developers to extend these tools. This is still germinating, of course. @Mike Kaply – We plan on making things configurable. @Anonymous – We need developer tools that are baked-in. Taking an add-on as complex and sophisticated as Firebug and landing it into the Firefox code base is not easy. The feature set we are looking at having in Firefox is more narrow than Firebug's as well. >Why are baked in developer tools needed exactly? Most of the worlds web browsing population aren't web developers and won't ever need to see the DOM or console messages. I'd even go as far as to argue that 'view source' and the basic error console aren't required features for most people.For developers there's Firebug and developers are the type of people that will already know about Firebug or be able to easily find out about it.Personally I'd say yes, put in the APIs that Firebug and other extensions can take advantage of, but don't bother re-inventing the wheel when it comes to what Firebug already does and does extremely well. >On one hand, I don't think it would be in Mozilla's best interest to delegate all of their web developer tools to the Firebug team. It might be a duplication of effort but at least Firefox will have a baseline feature set for web devs – especially if they are the same tools used by the moz team. >If firefox's console does not have the features of firebug, there is no point in having it at all.Everyone is use to firebug, its UI and feature. At first it the console looked promising but it I would still use firebug in a heart beat.Couldn't there be better things to work on then a console as again, your previous error console was fine as it was hardly used (ie. casual user might use it) but firebug dominants web development on firefox.It was fine the way it was. Maybe you guys should work on hardware acceleration in firefox like IE9. I hate to say this but if firefox doesn't pick up on this stuff now, it could be the end of a great browser. >@Fire UserIt seems like you are averse to change, and that is too bad. The console that landed in Beta 1 is just the beginning and has about 20% of the features it will have. (You have to start somewhere).I guess you have never been bitten by FireBug when it is incompatible with the latest version Firefox. Please understand, these efforts will actually improve Firebug as well. >Will this new console disable JIT when active like Firebug does? >To avoid these repetitive negative firebug related comments you should write a post clearly stating how this new inspector relates to empowering firebug (and other tools) in the future and helping firebug not be incompatible with future firefox releases.Then link to that article at the beginning of every future post on this subject.I took the time to look for a post on WHY there was this apparent duplication of effort and came up empty. Luckily I read your other responses in the comments and it started to make sense.